A few days ago the muxtape guy broke silence on what's going on with him and the RIAA. Short answer: he gave up. Probably wisely. As predicted, muxtape as you knew it is gone forever. There are, however, a number of contenders trying really hard to slide into everyone's consciousness as the replacement for muxtape. Favetape, for instance, is one of the most high-profile of the bunch. They've been doing a number of really cool things in the mixtape space, leaving me with little doubt that they're going to be the de-facto place people make their mixtapes. Until THEY get into things with the RIAA, that is. Sure, their model does not involve hosting any files (which is pretty dang cool, actually), but at the end of the day they're generating referral revenue using content for which they don't have a license. They will get shut down too. Unless they work out some kind of deal with the RIAA -- which means you're probably going to have to pay to use them. For the future? Hold on to your butts, for I've got a couple ideas in the works that may make mixtaping even easier with less risk of being shut down. If I have such ideas, you can be sure OTHER people do as well, which will make up for the fact that I'm notorious for getting all excited about a project and then completely abandoning it after very little of the work has been done. In the meantime, though: seriously check out Opentape. 1) muxtape is kind of addicting. I've crafted another muxtape for your listening pleasure. It is nothing like the other one: nyquildotorg.muxtape.com. In addition, I've also used muxtape to share with the world one of my favorite out-of-print albums: nakednaked.muxtape.com. 2) speaking of muxtape, my greasemonkey script to download and/or stream muxtapes is better than ever. Now you can easily copy/paste the filename for easier renaming without disrupting what's playing. 3) speaking of greasemonkey scripts, I just whipped one up that makes the total price of an item (including shipping) very apparent at a glance when searching for products on NewEgg.com. This was a request from Alexa, and I think it came out rather nicely. Greasemonkey is awesome. Having just been introduced to the dubious legality of muxtape.com, I decided to see if I could make it a bit more useful. I've been meaning to play around with greasemonkey again since it'd been a couple years since I had, so this seemed like the perfect opportunity. I found a script at userscripts.org that generates 'download' links for each of the songs on any muxtape page, then added to it the ability to generate an m3u (playlist file) which you can click to stream all the songs in your audio player of choice. No more having to leave a browser page open just to listen to muxtapes. No more having Flash take down your browser. Awesome. If you'd like to add this functionality to your muxtape experience, simply install Greasemonkey (or whatever IE/Opera plugin does the same thing) and head over and install muxtape downloader / m3u enabler from UserScripts.org. A few days ago Emalyse posted a little sonic doodle she had made, reminding me that I had been meaning to try to record some of the sonic doodling the Nintendo DS game Elektroplankton allows you to create. The thing that's fun about the game is that you just sort of click around on things and it effortlessly turns those clicks into "music." Most of the different modes have pretty unsatisfactory results, but my favorite works rather well. It consists of a grid full off arrows and 4 different plankton that each make their own sets of noises as they follow the arrows. By changing the direction of the arrows you can cause them to go into different loops, drastically changing the "song" that it makes. Here's a few minutes of me playing around: doodin' on my Nintendo DS [mp3 file]. I've been wanting to try my hand at creating electronic music on my computer for years, but, having made the decision over 10 years ago to limit myself to free open-source software (including operating systems), there hasn't really been many tools to suit my very limited knowledge in this area. There are apparently several really good tracker/sequencer applications available, but I'm apparently too stupid and non-musical to operate them. This morning I decided once and for all that I was going to try to make something vaguely resembling music, and that I was going to do it entirely with Audacity. The following (really shabby) "composition" is made entirely from the first 11 seconds of the Guns and Roses song Sweet Child of Mine, mangled and manipulated with a whole slew of Audacity plugins. Audacity is a lot clunkier than I'd like, meaning it's pretty difficult to get tracks lined up perfectly, so there's a lot of trainwrecking here and there, but I'm relatively pleased with it as a first attempt. I do realize that this is just several looping samples over top each other, and that I'm not really "composing" anything here; I'm mainly just trying to get the feel for Audacity and working with multiple tracks. If you enjoyed RE: Your Brains, and didn't expend the effort to see what the latest ol' Jonathan Coulton has done is, I urge you to take a second and check out Code Monkey as well. There're no zombies, but monkeys who program are just as good. I'll try to refrain from turning this into the "look at what Jonathan Coulton did now!! !1" blog, but I can't make any promises. Perhaps you are aware of Jonathan Coulton, his associations with John Hodgman, or even his Thing A Week. But have you heard his brilliantly hilarious song RE: Your Brains? As someone who loves both Jonathan Coulton and zombies, I highly recommend the song, which is easily my favorite of his Things A Week. Just click on 're your brains' towards the bottom to hear it -- you know, if you aren't afraid of having it stuck in your head the rest of the day. 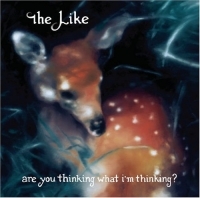 As promised, here's a couple mp3s from the debut album from The Like (it is kind of refreshing to find a band that is apparently without a website), entitled Are You Thinking What I'm Thinking?. UPDATE: These have been up for way too long, so you should just go buy the album rather than download them illegally from me. I like this album quite a bit, these young girls are verty talented. In a world of Lindsay Lohans and Hilary Buffs Duffs, it is refreshing to hear some quality work from attractive young women. As this album is available commercially -- and came out less than a month ago to boot -- you really shouldn't steal it. I'm providing these 2 songs in a lame attempt at fan marketing, which is something which will probably get me in trouble if the record label finds out.